NEW ALTO SAXOPHONE W/CASE. Genuine ALL COLOR Alto Saxophone, Model #AS235, Latest Europe-designed, High quality leather pads with metal resonators for improved tone and to eliminate leaks. Comfortable white mother of pearl key inlays. Blow easily for the full range. Highly recommended by teachers and musicians for years. High F # Key. Gold brass, Nickel/silver , Black , Blue , Red , Green , Purple and White Color available. No additional charge for this option for Lucky Winner. Most used instrument turn out needing repairs, some of them could be very costly. But now, you don’t need to be worry that on our instrument. If for any reason you are not delighted with this Instrument. Check other colors or more items in detail, please visit our store. Thank you for Looking! 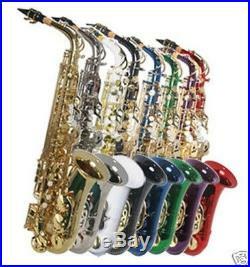 The item “NEW CONCERT BAND ALTO SAXOPHONE-APPROVED+WARRANTY-ALL COLOR AVAILABLE” is in sale since Friday, February 10, 2012. This item is in the category “Musical Instruments & Gear\Wind & Woodwind\Band & Orchestral\Saxophones”. The seller is “greatmusiconline” and is located in CA. This item can be shipped to United States, Canada, United Kingdom, Denmark, Romania, Slovakia, Bulgaria, Czech republic, Finland, Hungary, Latvia, Lithuania, Malta, Estonia, Australia, Greece, Portugal, Cyprus, Slovenia, Japan, China, Sweden, South Korea, Indonesia, Taiwan, South africa, Thailand, Belgium, France, Hong Kong, Ireland, Netherlands, Poland, Spain, Italy, Germany, Austria, Bahamas, Israel, Mexico, New Zealand, Philippines, Singapore, Switzerland, Norway, Saudi arabia, Ukraine, United arab emirates, Qatar, Kuwait, Bahrain, Croatia, Malaysia, Brazil, Chile, Colombia, Costa rica, Panama, Trinidad and tobago, Guatemala, Honduras, Jamaica, Antigua and barbuda, Aruba, Belize, Dominica, Grenada, Saint kitts and nevis, Saint lucia, Montserrat, Turks and caicos islands, Barbados, Bangladesh, Bermuda, Brunei darussalam, Bolivia, Ecuador, Egypt, French guiana, Guernsey, Gibraltar, Guadeloupe, Iceland, Jersey, Jordan, Cambodia, Cayman islands, Liechtenstein, Sri lanka, Luxembourg, Monaco, Macao, Martinique, Maldives, Nicaragua, Oman, Peru, Pakistan, Paraguay, Reunion, Viet nam, Uruguay.